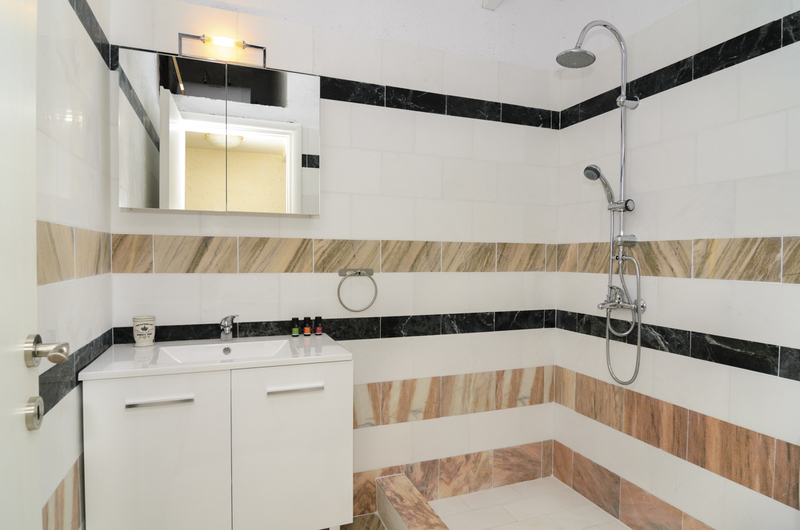 If villas were romances, two-bedroomed Lingonberry would be the love-at-first-sight kind. 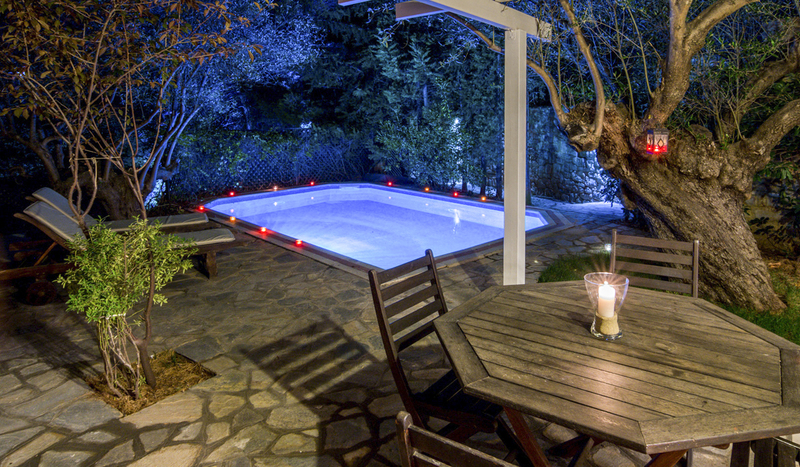 This charming villa is nestled in a quiet and peaceful spot in Halkidiki on Greece’s northern coast and is surrounded by tall trees and shrubs for your utmost privacy and tranquillity. 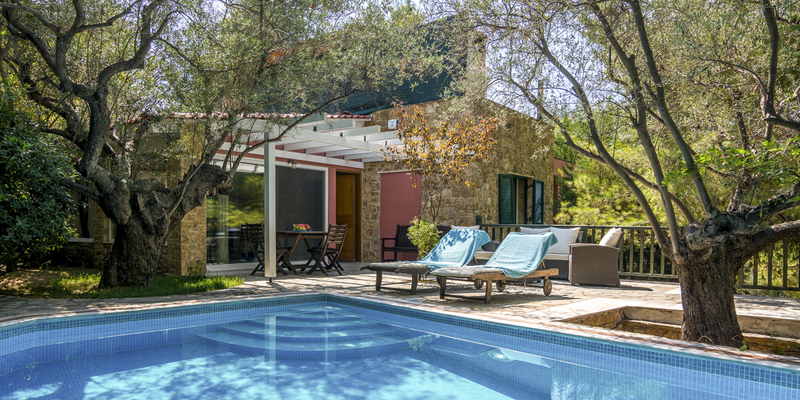 Sit in the garden and be at one with nature when reading your favourite holiday book under the boughs of the tree or take a cooling dip in the crystal-clear waters of your private outdoor swimming pool. 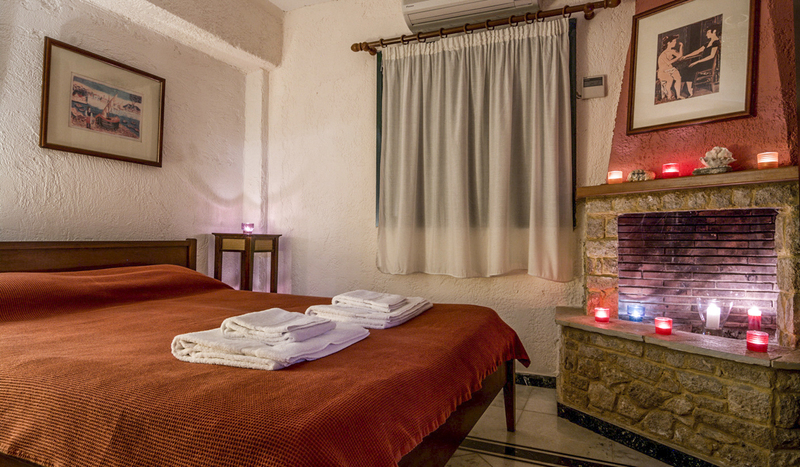 With candles and lanterns creating a romantic setting by night and two spacious and stylish double bedrooms, Lingonberry Villa is an ideal choice for couples. 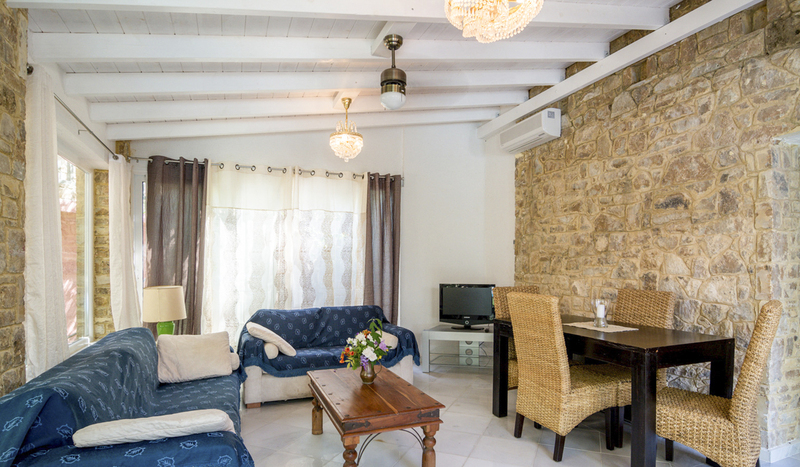 The villa boasts a fully-equipped kitchen and living room with an authentic stone-built fireplace for a cottage-like feel. The exposed stone and dark wood furnishings are traditionally Mediterranean in style and are elegantly complimented with natural-coloured bed linen, whitewashed walls and subtle pops of colour in the artwork. Outside, the paved terrace area is dotted with cushioned sun loungers and includes an al fresco dining table and plenty of chairs so you can find your prime sunbathing or shaded spot. One of the bedrooms also has a balcony with a small table and chairs so you can enjoy the serene views over your morning coffee or orange juice. 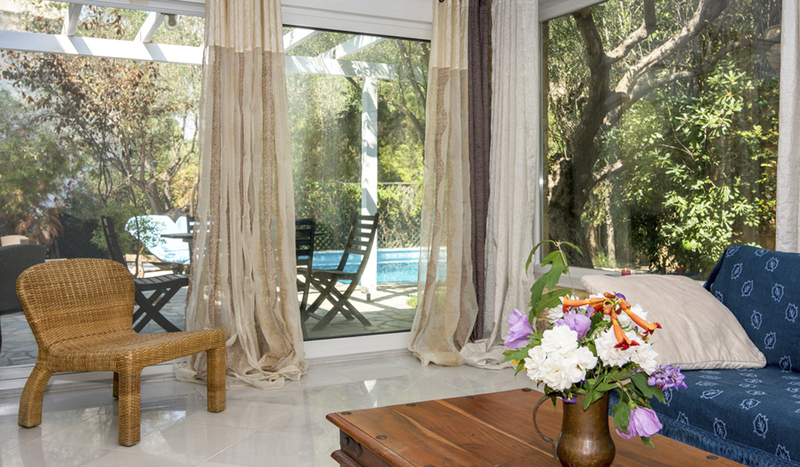 Floor-to-ceiling windows and doors throughout the villa let the beautiful outdoors in, and there’s internet and a plasma television for a home-from-home feel. For when you can bring yourself to leave this serene haven, sandy beaches and Instagram-worthy villages draped in bougainvillaea flowers are a short walk or drive away. Join a trail that traverses the pine forests and mountainous peninsula, tantalise your taste buds with fresh local cuisine like fish mezes or moussaka or quench your thirst for adrenaline by taking part in water sports like scuba diving or parasailing. With exciting historical sites nearby too, Halkidiki really spoils for choice. 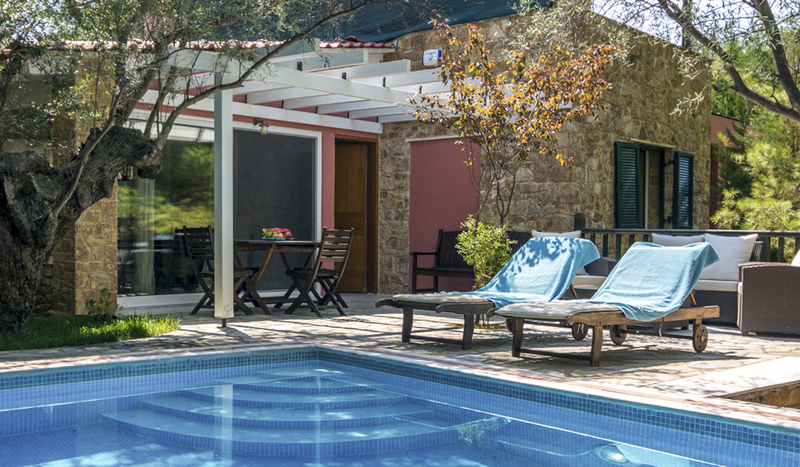 Lingonberry Villa is in Halkidiki, a beautiful region in northern Greece. The area is known for its jutting peninsulas, featuring pine tree-lined forests that give way to sandy beaches in sheltered bays. It’s a fantastic base to explore historic ruins from or engage in the many local activities like hiking, walking or mountain biking the beautiful tracks that traverse this stunning part of Greece. You can head to Mount Itamos, the highest peak on Sithonia for panoramic views over the peninsula and a fantastic bird’s eye view of Mount Athos to the east and Mount Olympus in the west. For relaxing afternoons spent near the coast, there are fifty Blue Flag beaches with calm crystal-clear waters for you to choose from. 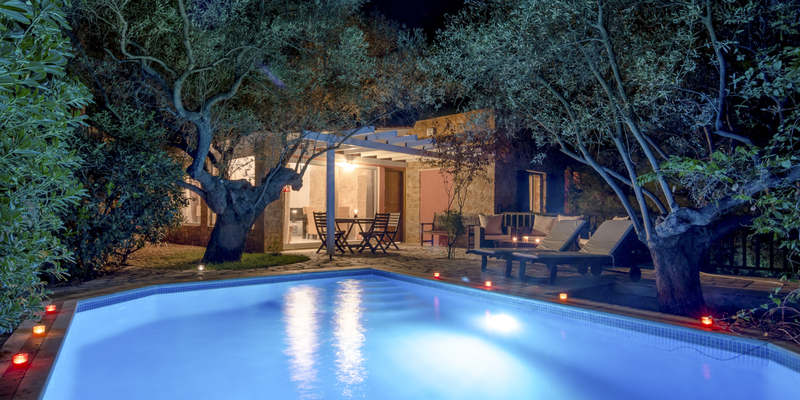 The villa is close to Akti Elia, a mix of soft sand and pebbles where you can peacefully while away the afternoon on the shore or in the glistening Aegean. You’ll also find plenty of opportunities to take part in water sports like sea kayaking and scuba diving at many of the beaches. Colourful corals, blue lagoons and rocky caves are waiting for you to explore them. For fun day trips, you could hire a small self-rowed boat or jump on an organised boat excursion and glide along the coast past Mount Athos or sail to beach-blessed Vourvourou and Ammouliani islands. There are plenty of quaint villages in the area to explore with local restaurants serving traditional Greek cuisine and shops selling everything from souvenirs to fresh produce. Ouranoupolis village – a short drive from the villa – has Byzantine monuments and pretty beaches. Parthenonas is also a great choice. It’s sitting pretty on the slopes of Mount Itamos and features stone houses, taverns, a museum and sea views which are exceptionally beautiful at sunset.